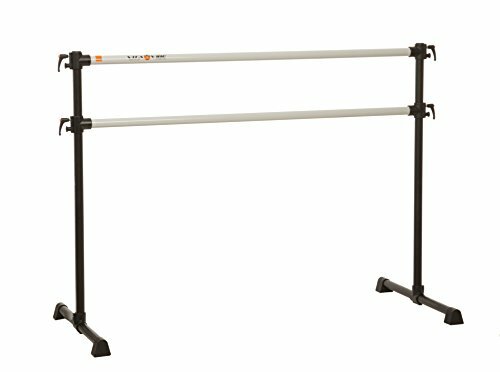 Professional Series barres are designed for commercial/studio use. Vita Vibe Professional Series Aluminum Barres are manufactured from 1-1/2" diameter aluminum with a .100" wall thickness, which is 50% heavier and thicker than our Prodigy Series barres. The Professional Series barres feature Vita Vibe's exclusive anti-microbial powder coated satin silver and matte black finish that provides long lasting beauty and inhibits the growth and transmission of harmful microbes. The Professional Series features sure-setTM indexable height adjustments from 20" to 46" provide accurate height adjustment. We typically recommend setting the barres at elbow height of the user. 100% satisfaction guarantee. If you have any questions about this product by Vita Vibe Pro Ballet Barres, contact us by completing and submitting the form below. If you are looking for a specif part number, please include it with your message.